April -- with Andrew Moss and Adam Wolven. April 21, 2001. 10 Pages. And an older page: Downtown with Phil Stevens Dec 24, 1998. 1 Page. Note: the July pictures are rather large, and will take some time to download on a modem connection. 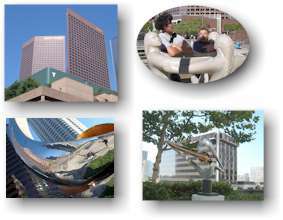 I decided not to reduce the image size by much because I wanted some high-quality pictures of downtown L.A. Also, most of my audience has broadband connection to my web page. When I take people downtown, I have sort of a standard walking tour. There's a map on the July page. We usually start at 6th & Hope, the corner where Biola University got its start. From there, we go north to the Central Library. 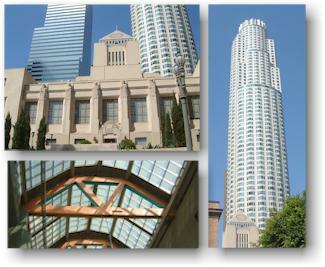 The library is open on Sunday afternoons, which is usually when I lead these downtown tours. 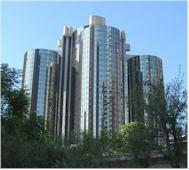 From the library area, we go to the Bonaventure Hotel. It's about 30 stories high, so it's not as tall as some of the other buildings, but it has glass elevators that run on the outside of the building, so you can see a good view of the city as you go up. They also have a revolving bar at the top, and if you go when the bar's not too busy, you can walk around and look out. 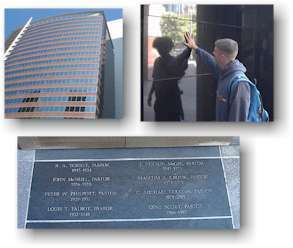 From the blue elevators in the Bonaventure, get off at floor 5, and walk up the steps to the 6th floor. There's a bridge that connects to the downtown YMCA. They have some interesting art there. From there, you can see the Wells Fargo Center. That's where you can see the buildings that look like they're only 2 inches thick, from the right angle. The Water Court is just across the street from the California Plaza. That's also where the top of Angel's Flight is. 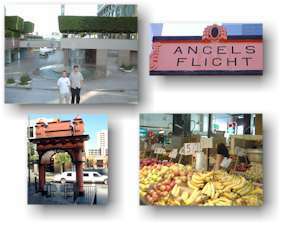 We usually walk down Angel's Flight to the Grand Central Market, then back to the subway station. At this point in the tour, we usually get back on the subway, at the Pershing Square station. Sometimes we go through the Biltmore Hotel which is right there across the street. Sometimes we take the subway up to Olvera Street or to Philippe French Dipped Sandwitches (See http://www.philippes.com/). You can get to both of these places from the Union Station subway stop. A picture of Philippes on the Downtown with Gilberts page. More subway pictures and Union Station from a 1998 Subway Trip. 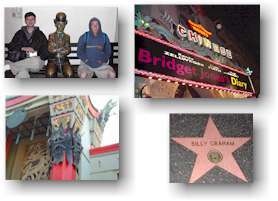 Another of my favorite destinations from the subway is to go downtown Hollywood, where you can see the Mann Chinese Theater and the Walk of Fame. 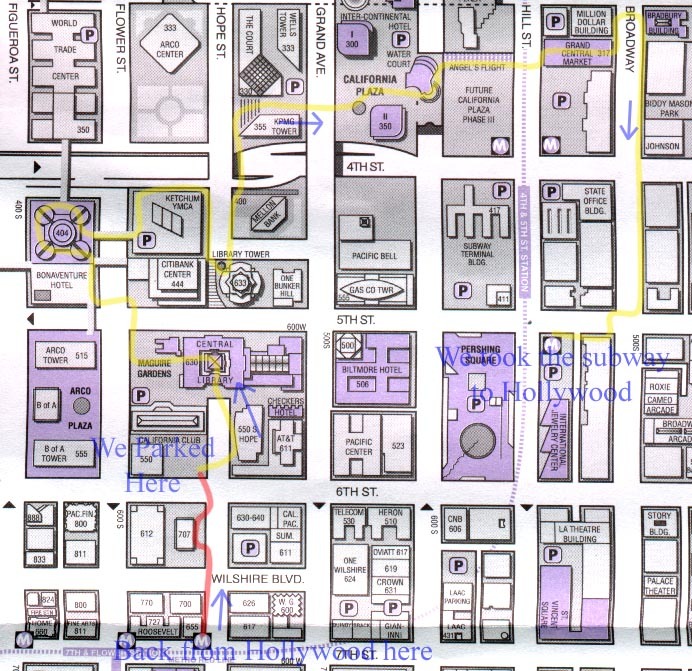 The subway stations along Hollywood Boulevard are fairly recent -- opened in 2000, I think. At this point in the tour, everyone is usually ready to go home, so we usually just ride the train back to the car and drive home. It would be fun to go down there sometime just to watch a movie. I've seen some Disney films at the El Capitan Theater. I also saw "The Fugitive" at the Chinese Theater. Jon Clede told me about a website called skyscraperpage.com. They list the world's tallest skyscrapers, and have diagrams showing their relative height. Here are the tallest six in downtown L.A.